Industrial scales are quite different than the common household scale most people are familiar with. Unlike these scales, industrial scales are often utilized in environments where they are exposed to harsh conditions. Withstanding extremely heavy loads, sustaining chemical exposure, and resisting shock load, are just some of the types of abuse these devices endure. Therefore, the construction of these digital scales must be rugged, durable, and top-notched. Arlyn Scales offers a large variety of industrial scales that are perfect for any difficult job. For weighing liquids housed in drums, or liquefied gas enclosed in cylinders, the drum scales and cylinder scales by Arlyn Scales are a perfect choice. Crane scales easily weigh and unload awkward heavy packages in one easy step. Parts counting scales are well used in postal services for weighing bulk mail or in factories for weighing small hardware parts in large quantities. Industrial scales by Arlyn Scales are unmatched. They achieve high-levels of accuracy, that many other industrial scales lack. For starters, Arlyn Scales uses a four-sensor design on their larger platform scales and floor scales. A load sensor is placed in each of the four corners of the scale’s platform dispersing the weight of the load evenly. This guarantees good accuracy, no matter where the load is placed. To further advance the accuracy of their scales, Arlyn Scales developed a line of scales with super sensitivity. Their ultra precision scales and high-resolution scales are incorporate unique Surface Acoustic Wave (SAW) technology. With an accuracy of 0.005% and a display resolution up to 1 part in 400,000 these scales are exceptional. The internal resolution of these scales is up to 1 part in 2 million! This is about 20 times higher than that of the average electronic scale. While most manufacturers construct their load sensors using aluminum or nickel plated steel, Arlyn Scales construct their load sensors with a very durable stainless steel alloy. The use of this material helps to guard the scale against load sensor failure. This type of failure is one of the most common types of malfunction of digital scales. Weighing heavy loads that exceed a scale’s capacity can cause elastic deformation of the material. The load sensors can even be damaged when objects are dropped on the platform. Forklifts can shock the sensors by accidentally hitting the scales. Arlyn Scales designed their scales to tolerate higher levels of side load, overload, and shock load. Most digital indicators include a warning message warning on their industrial scales to tell the scale operator when their scale is in danger of overload. Thanks to the use of durable stainless steel load sensors, the platform of these scales can now be of lower profile and larger. Very low profile Platform scales can now range from the standard 20 x 27 platform size all the way up to the very large 48Ó x 48 platform size. They have even created industrial scales that are built in custom sizes and ones that are available in full stainless steel construction. Besides improving their scales with rugged stainless steel load sensors, an additional option is provided to make the platform of the scales exceptionally durable. An epoxy coating enriched with zinc is applied to cover the steel platform scales. While many other types of this epoxy layers are affected by sunlight exposure, Arlyn scales will not be severely affected, even after many years of exposure. 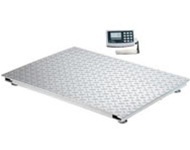 Arlyn Scales offers a line of corrosion resistant platform scales, floor scales, pallet scales and drum scales. These electronic scales are ideal for operating in especially harsh conditions. Weighing cylinders that contain chemicals or harmful materials, such as chlorine, ammonia and fluoride, are done with peace of mind. These industrial scales are designed to be user-friendly. A large 1 high graphics digital display and swivel mount allows the scale operator to easily view the measurements from virtually any angle. Thanks to the pushbutton functions, users can operate the scale with just a push of the button. A keyboard tare provides the user with 450 memory locations and multiple unit conversions right at their fingertips. The industrial scales by Arlyn Scales are not only accurate and durable, but they include compatibility to modern technology such as computers, printers, and the Internet. Universal Serial Bus (USB) ports, RS-232, and RS-485 as well as Ethernet connection is available on these electronic scales. In addition specialized software is available to help scale users transform their weight measurements into data that can be recorded or run in reports to further increase industrial productivity.